The only endorsed resource of its kind – specifically for English as a Second Language students. This write-in book ensures students get plenty of practice with the summary and note-taking aspects of Cambridge IGCSE English as a Second Language. With revised content, students can choose sections to practise, building confidence ready for the revised exam from 2019, which has a heavier weighting on summary writing. Answers at the back of the book make it perfect for self-study or classroom use – helping teachers save time marking and students to understand the requirements of the exam. This book is also suitable for anyone wanting to develop academic English for university and beyond, including first language students. This ‘with answers’ edition includes sample answers with teacher comments that help students understand what is required of them. Includes Cambridge IGCSE English as a Second Language Core and Extended exam-style questions, providing differentiation opportunities. 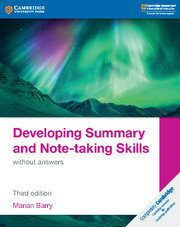 First language students can also use this book to develop their skills. Combines practice in summary and note-taking with guided help across six themes – Science and the body, Animal life, World of plants, Personal challenges, Leisure and lifestyle, and Trends – past, present and future. Skills strategy training in every task helps students think about how they structure their answers. The Skills builder sections in the note-taking tasks support the student turn notes into organised text. The combined vocabulary and writing pages offer deeper learning and develop learning strategies. The ‘without answers’ edition is ideal for classroom or homework use. Summary 1 All in the mind? Summary 10 What's for dinner, Mum? Topic vocabulary and writing tasks: Acknowledgements: Teacher notes (with Key edition only): Answer key (with Key edition only).